Yet another Malabar delicacy which is known for its taste and flavor. Here lamb or mutton is cooked with little spices and then sauteed along with the onion gravy, the traditional way of making lamb biryani. 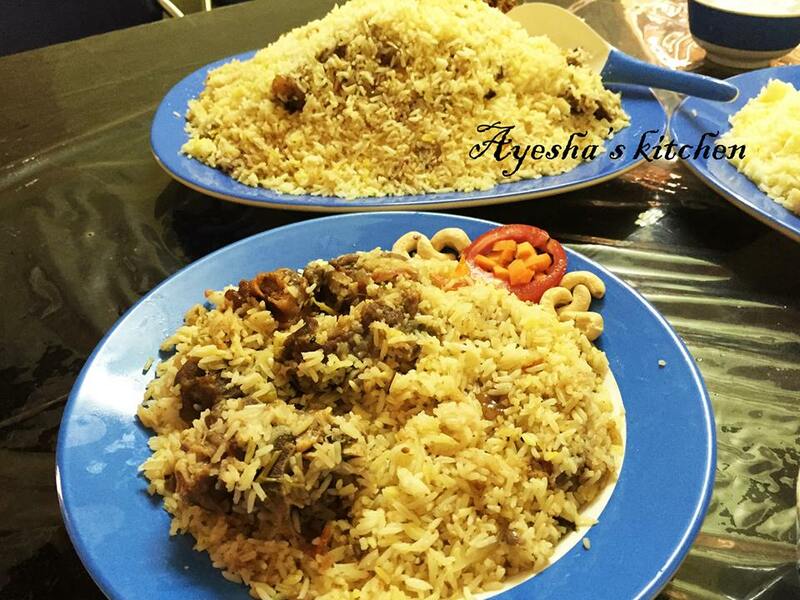 The stock water after cooking mutton is used for cooking rice which makes this biryani a drooling taste. Hope you all give this lamb recipe a try. Marinate the mutton with all the ingredients, as above given for the marination. Keep it refrigerated for 2 hours. Then put the mutton in a cooker and pressure cook it for 3 whistles. When it is done and the pressure settled down, open the lid and drain the water to a bowl and keep a half cup of the stock water separately. Keep aside the mutton and water in a separate bowl. Now the next step is boiling the rice. 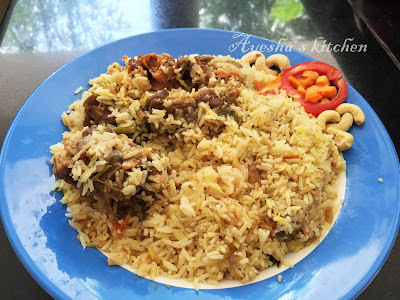 So take a vessel and add the stock water drained from cooked mutton (water must be more than double the amount of rice. so u can add extra normal water if the stock is not enough. When it starts boiling, add vinegar and 1 tbsp oil to it and close the lid. Now drain the water in the rice and keep the rice aside in a colander. Again heat ghee in a deep bottomed vessel. Saute well, when done add the cooked mutton along with half cup of stock and close the lid. Allow it to cook for few minutes and then open the lid and again cook for another 5 minutes to get a thick gravy. Now add salt, mint and coriander leaves. Mix well. Now drop some boiled rice over the masala, then spread chopped coriander leaves and some drops of ghee. Again layer the rice and repeat it. This process is called Dum. Finally, garnish with coriander leaves and spread some ghee on the top evenly. Close the lid tightly and can keep some weight over the vessel (optional). Or can close all the ends of the vessels with maida (All purpose flour) dough. Allow it to cook on very low flame for 30 minutes. While serving garnish with fried cashews ,raisins, and fried onion.